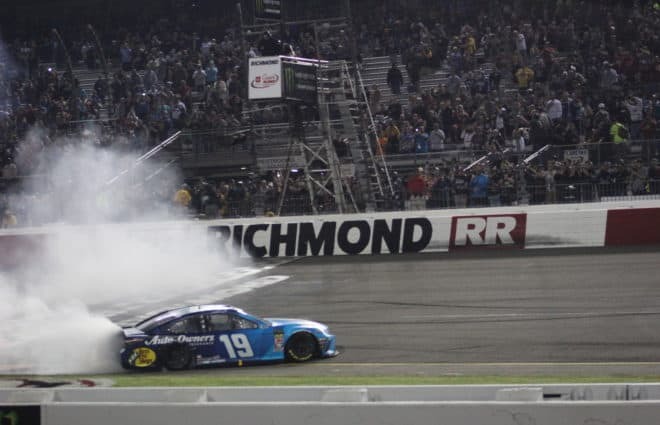 NASCAR 101: Martin Truex Jr. Finally Won a Short Track Race — Who’s Next? 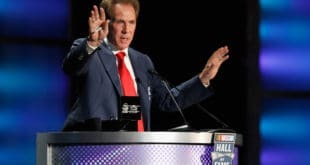 4 Burning Questions: What’s Wrong With the NASCAR Hall of Fame? 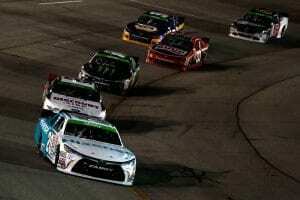 If you’re engrossed by the NASCAR XFINITY Series or Verizon IndyCar Series, you may have heard that phrase blast through your TV set the last few years. That’s because Leigh Diffey has a knack for springing with excitement. It’s kind of his thing. 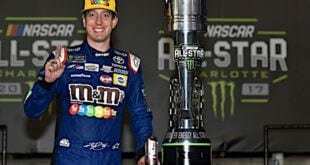 But where he is most heard in the United States is in the FIA Formula 1 World Championship, where he commentates the sport each round alongside Steve Matchett and David Hobbs on NBC Sports Network. In fact, the 2017 season marks his 20th year of calling F1. Frontstretch spoke with the Australian broadcaster to learn about his beginnings in commentating, how he calls a Formula 1 race and balancing tragedy and triumph from the booth. 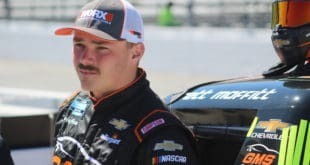 Zach Catanzareti, Frontstretch.com: When was your first realization that you liked to talk? And that you knew you were going to be into broadcasting? She walked around the corner and there I was standing on a box in front of a microphone addressing my fellow first-grade students. I was the MC for a pet show [laughs]. So, I guess the roots started a long time ago. Catanzareti: When did it turn to racing? What was it about motor sports that turned you on? Diffey: My father and grandfather were very much into motorcycles. Our family became involved when I was very young. So, when I was at that same age, about six years old, I started racing motorcycles in Australia. I raced through until my teens and also had a lot of friends particularly in the motorcycling before I ever got to cars. Two of my really good friends Mick Doohan and Daryl Beattie went on to be Nos. 1 and 2 in the world in MotoGP. Mick went on to win five world titles. Then, I had a lot of other friends, whether it be in motorcycles, road racing, dirt tracks, motocross, supercross. I was just always around it. That’s how I ended up falling into commentary into the local motorcycle club just outside Brisbane in Australia. I think I was 20 or 21 when that first happened. I was about to graduate from a university with a degree in education in teaching — professionally, I’m a physical education teacher. There were always other things going on and I was enjoying doing this sporadic commentary at a local level with public address systems. Over time, it kind of grew. Catanzareti: While you were going up the ladder, did you have any mentors, maybe who you listened to and looked up to? Diffey: I’ve always loved all sports. Even to this day, because I’m involved in so much motor sport, I’m either doing it myself or watching. But I really enjoy watching all forms of sport, here in the U.S. Ill watch NFL, I watch golf all year round, English Premier League Soccer. I can’t really pin-point one particular person who motivated me in commentary, and that’s because I enjoy listening to a variety. I have my favorites and those who aren’t my favorite, but I’ve always found that watching a variety of sports for enjoyment first and foremost, I think that really helped me and also motivated me. There was a very famous radio announcer in Australia by the name of John Laws. He had a very motivating story, he has one of the most unbelievable voices you’ve ever heard. He was told that he had the wrong voice and that he would never make it, and he ended up becoming Australia’s highest-paid radio broadcaster for many years. I was always spurred on by his story. He wasn’t a sports commentator, but he was a phenomenal broadcaster. Catanzareti: Let’s jump into the Formula 1 side, when did your first opportunity arise to cover F1? Diffey: I was first involved in Formula 1 broadcast 20 years ago in 1997 in Australia. That was the first time I had ever been to a F1 Grand Prix and it blew me away. The noise, the sound, the speed, just everything about it. Of course, I had been watching it on TV long before then, but to actually be there in person and be a part of a broadcast in Australia was very motivating. I liked the look and sound and the feel of it. I feel very fortunate to have had that experience so young in my career. Still, to be standing here 20 years later talking to yourself about it. Catanzareti: So, you’re celebrating 20 years in F1. Looking back two decades, did you think you would have accomplished what you have? Diffey: No, you always dream big. I think it’s important to dream. I always tell my two sons, sleep well and dream big. I cannot have imagined to be here — especially being a foreign voice in a foreign land. Even though I’m an American citizen, I’ve been here for a long, long time, to work for an organization like NBC Sports not only to do Formula 1 but also the Olympic Games, Summer and Winters games. To do the variety of sports NBC allows me to do is just phenomenal. Catanzareti: Traveling all over the world, it seems the setup on TV is similar. Is every track similar? Diffey: The way that we do Formula 1 is — I wouldn’t say unique, but it’s kind of special. The majority of the season we actually do from NBC Sports headquarters, where Will Buxton and our pit producer Jason Swales, those guys are on the ground each and every grand prix. We are actually on location for three grands prix, we go to Monaco, this year we’ll be going to Mexico City and of course in Austin, Texas, for the U.S. Grand Prix. We see that as being a benefit. We have the best of both worlds. We in our regular surrounds in the studio where we have all our recourses at our disposal and then we have Will and Jason on the ground. And when the full team is on location, that’s even more special. It’s a special approach to it, but it’s one we feel works quite well. Catanzareti: Obviously in F1, the biggest moment of the race is always the first turn of the first lap. That’s a little different than other motor sports, so with that buildup, how does that first turn compare to anything else? It’s always a huge marquee moment. Diffey: It really is. And whether you’re calling NASCAR or touring cars, it’s always the start and Turn 1. Those are the two really cools things in a broadcast to look forward to. I personally love it when in a F1 grand prix they’re doing their final zig-zags, warming and trying to keep as much heat in the tires and they finally get into their grid spots. you’re waiting for those final three or four cars on row 10 or 11 to come into play. Then, you know it’s a matter of seconds before the lights are eliminated and then extinguished. To me, that’s the most exciting part of a grand prix other than the finish. The buildup to the start — What’s going to happen? Who’s going to get the best start? Who’s going to blow the start? We saw Lewis Hamilton have a handful of terrible starts last year. Who has that execution? Who’s going to make it to Turn 1? A year ago in Melbourne, the front row was a Mercedes lockout, a very familiar sight, and then Sebastian Vettel just blew them away, went right through the middle and he made Turn 1 first. It’s that building of anticipation, and then when the lights go out, it’s a stunning moment in the grand prix. Catanzareti: I bet you’ve been asked this before, but your one-liner is “It’s time to bring the action!” So, how did that come about, how did you make that your special kickoff phrase? Diffey: Well, it came about through a friend of mine in Charlotte, North Carolina, where I used to live. His name is Chris Graham. When we would play golf together, we would joke around, whether we were jibbing at each other or not. I would step up onto the next tee box, he’s a very good golfer, and he would always look around at me and say, “It’s time to bring the action!” And then he would hit his golf ball, or I would say it to him, but there was no way I could ever drive it as far as he could. It started as a joke, but I think it’s such an appropriate catchphrase for the beginning of the race. Because… that’s what it is, it’s time to bring the action. All the talk is over, all the lead-up, all the engineering work has been done, all the preparation is done and there is only one time. And that’s the time you have to bring the action. I enjoy saying it and I get a lot of feedback on social media, people look forward to it. I never set out to have a catchphrase just for show, but it just kind of happened and it feels good. Catanzareti: It really makes you an electrifying pair alongside Steve Matchett. He’s incredibly knowledgeable about the sport. How much do you take in from him? He definitely seems very animated during the races. Diffey: The dynamic in any commentary booth is really interesting. I have always said this: the chemistry off air will lead to the chemistry on air. Meaning, you have to get on and have a relationship with your broadcast partners. If you have a really good off-air chemistry and relationship and synergy, then it makes it easy to come across on air. I think that David [Hobbs], Steve and I have that. We’re three very different people from three very different backgrounds. Steve from the technical side of living and breathing Formula 1, to David, who has raced all categories of motor sport pretty much, and then me as a kid from Australia who started out in motorcycles and who is a broadcaster first and foremost. We get really well, Steve is my big brother and David is our dad [laughs] and we have a lot of fun off air. We take it very seriously but you have to blend that seriousness with a little bit of fun to make it entertaining and enjoyable, not only for ourselves but the most important thing is our viewers. Catanzareti: I bet David has shown you guys some great stories in the past, he has been in it for so, so long. Does he tell you guys stories? Do you guys really talk about the history of racing together? Diffey: Yeah, he doesn’t set out to say ‘Hey, listen you guys, I’ve got to tell you about this.’ It just happens organically through conversations, through dinners, through having a coffee in the morning. David id incredibly humble. he doesn’t talk about the amazing things he’s achieved, not only behind the wheel, but behind the microphone. The guy commentated 18 Daytona 500s, let alone driving in the Daytona 500, racing the Indy 500 for Roger Penske, driving in Formula 1 with McLaren. He did 20 24 Hours of Lemans’. You know? And he won his class of Lemans two or three times that he doesn’t consider he ever won, because for him, winning Lemans is winning the whole thing. He’s a very humble guy. He doesn’t beat his chest and say, ‘Listen to me, this is what I’ve achieved.’ And that’s what makes David, David. He’s a really lovely human being. 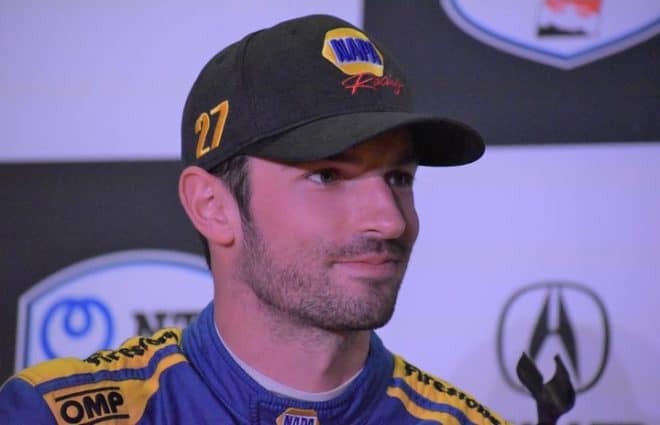 Catanzareti: Slipping into the NASCAR-IndyCar side, you’ve been able to do a few of those races over the last few years. I bet you enjoy doing them, but I bet there are some big differences, especially being at the racetrack? Diffey: IndyCar is very close to my heart, that’s the reason I came to America, to call IndyCar back in 2002. I really enjoy IndyCar and it’s just the conflict of the schedule that prevents me from doing more. Especially with F1, as they dumped on a couple extra races per year, there’s’ just collisions in the calendar. I love it. All the drivers are terrific, each have very different personalities, all very approachable. It’s great to get in there amongst the teams in the paddock, it’s a very open-door policy, we have great relationships. I’m very lucky to call a lot of the drivers friends of mine. And the racing, I mean, IndyCar is just incredible. What is it now, the last 11 years the championship has come down to the final race? Which is phenomenal. And then the NASCAR side, I only did one race last year. 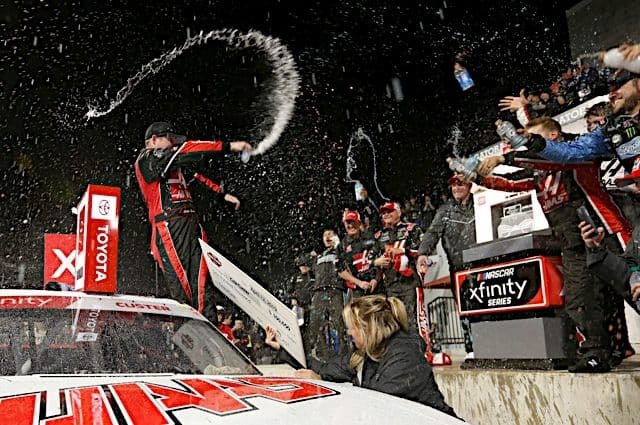 I did more the year before , I did more XFINITY races. But this year, I think Ill do some XFINITY and a couple Cup races as well. So, I’m looking forward to that. That’s just a cover in the water. Again, whenever you do something you don’t regularly do, it’s very enjoyable and it makes you get on your toes and put in the extra effort while speaking to a completely different audience. That’s the beauty of working where I do with NBC, we have so many different motor sports. I’m really fortunate to be amongst it all. Catanzareti: You have such a large perspective in racing. In your opinion, what is the health of motor sports? 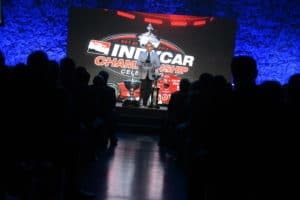 Diffey: The health of racing always comes down to two things: the corporate dollar and the spectators and how viable they feel it is to go to the track, take their families and sit on the hill and watch. Then you have the entertainment-business perspective, whether it be corporate America, corporate Germany, corporate Australia, England, whether they see it as a viable business relationship. As long as that stays in place — the television coverage of motor sport wherever you are in the world is terrific. So, that box is checked. You have to make sure to keep it entertaining. Once something doesn’t become entertaining, or if it becomes too expensive from a consumer standpoint or the participants, then it becomes less attractive to be involved in. As long as NASCAR, Formula 1, Global Rallycross, whatever the category may be, as long as you stay within the banners of keeping it affordable, I think the health will be fine. Catanzareti: Some race calls you have made will be remembered forever. Your reaction is replayed over and over forever. Do you try to keep your in-race emotions in check? Diffey: You actually can’t because it’s in the moment. That’s the one big thing that I think some of our viewers and others in the industry don’t understand. if you’re sitting in a press room and writing an article, web article or newspaper, you get a chance to sit back, analyze that, watch replays on TV and maybe download it and watch on your Smartphone before you make your final conviction. We don’t get that luxury. It’s live, it’s in the moment and we say in the split-second what ever it is that pops into our heads. Sometimes, it’s fantastic for a terrific move or a race victory. Sometimes, its controversial like when the Mercedes pair took each other out last year in Spain. And other times, it’s horrendous and horrific like when somebody loses their life. I was obviously commentating the race where Jules Bianchi hit the crane [Japan, 2014]. Obviously, he didn’t die instantly but many months later. I was calling the race at the Pocono 500 when Justin Wilson lost his life. You can’t plan what you’re going to say. You’re in the moment. The positive ones, the happy ones, those happy, thrilling moments, they’re the easy ones. It’s when there is some tragedy and some hardship, that’s when you have to speak of a fine balance between your heart and your head. That’s the difficult part of broadcasting, when it is such a delicate and sensitive moment — you have to choose your words very wisely. You also don’t get much opportunity because you’re in the moment. Catanzareti: Experiences like that must broadened your perspective. You’ve seen the great days, but also the bad. How does that, I’m not going to say help, but broadened your understanding of the nature of racing? Diffey: It does. I think overall it makes you a broader broadcaster, it makes you a better broadcaster. It also makes you a more thoughtful broadcaster. At times, these people who we’re commentating on are our friends. Jules Bianchi was Will Buxton’s squash buddy, they played squash together. Justin Wilson I’ve known since he raced in Formula 1. At Le Mans, when I used to call sports car, my good mates Allan McNish had one of the most horrific crashes in the Audi that you’ve ever seen. Another good buddy of ours Mike Rockenfeller, he was leading the race and had an accident at night. We didn’t even know where he was, let alone where the car was. Catanzareti: Years from now, when your career is over and you look back on everything, how would you like to be remembered in racing? Do you feel you have made your impact? 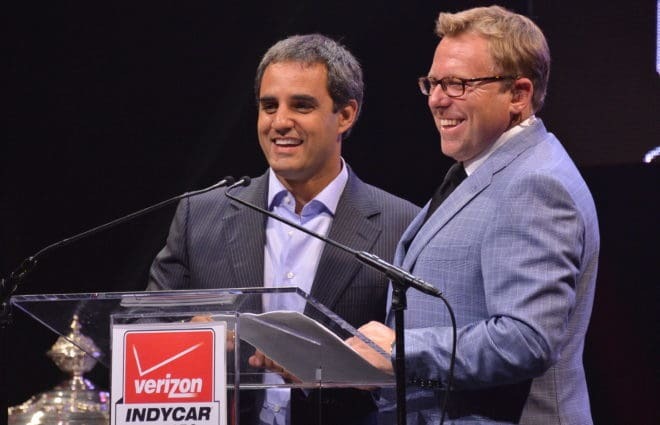 Diffey: I just like to be remembered for the guy who brought a lot of enthusiasm and enjoyment and good story-telling. I made it a good time, that’s what I would like to be remembered for. I made the viewers enjoy it, helped them understand maybe not the business of racing, but the sport of motor sport and racing. Hopefully they will remember me for being enthusiastic and passionate. 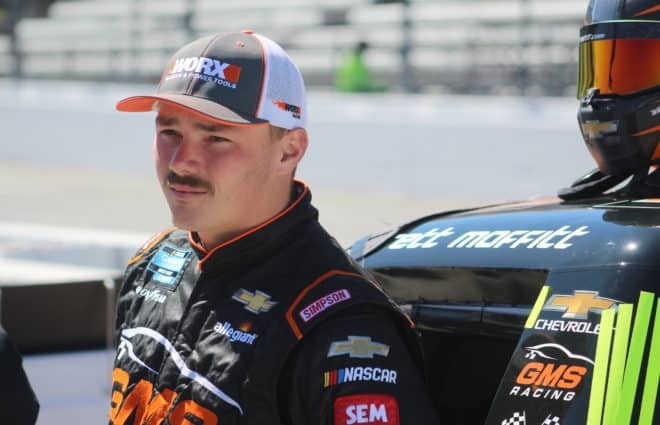 Growing up in Easton, Pa., Zach Catanzareti has grown his auto racing interest from fandom to professional. 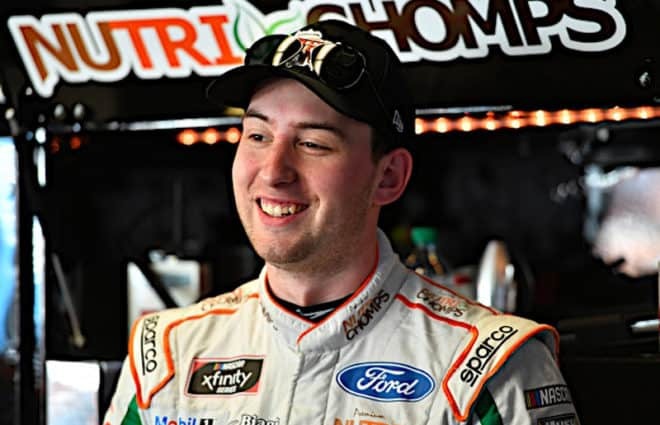 Joining Frontstretch in 2015, Zach enjoys nothing more than being at the track, having covered his first half-season of 18 races in the Monster Energy NASCAR Cup Series in 2017. With experience behind the wheel, behind the camera and in the media center, he thrives on being an all-around reporter. Lee is the best main commentator in motorsports, bar none! Most of the main guys have a fake Mr. Hollywood inflection. But not Lee. He’s a rarity, in that he’s someone with intimate personal motorsports experience who is also an articulate master of language. Head & shoulders above all of the main motorsports guys, at Focks, NBC, or where ever. Very enjoyable to listen to. Diffey, Hobbs and Matchett are the worst broadcasters for F1. I thought Jackie Stewart was annoying, but I would take him back over these three. Bob Varsha is the best current TV race broadcaster. Diffey is so annoying and unbelievable. He tries to make something out of non issues. Just stick to the facts.